The Role of “Mr. 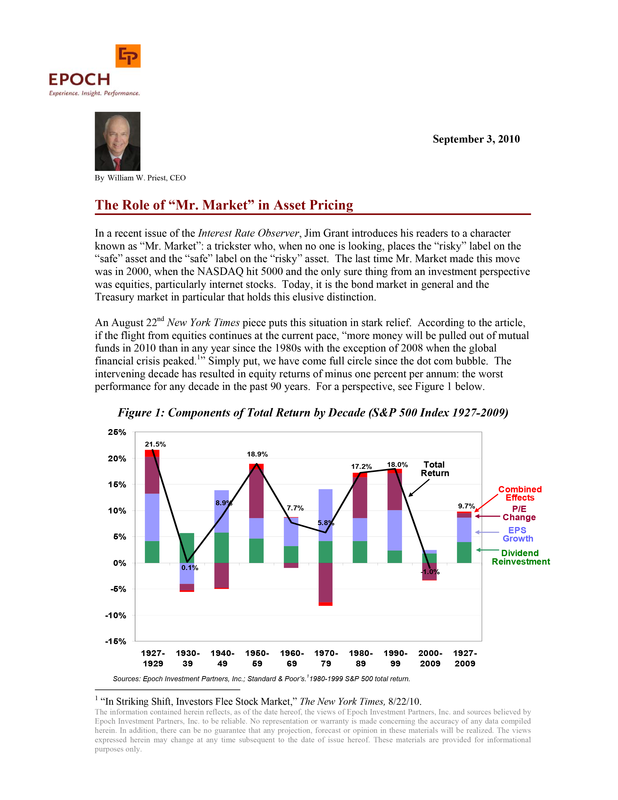 Market” in Asset Pricing - Epoch Investment Partners, Inc. In a recent issue of the Interest Rate Observer, Jim Grant introduces his readers to a character known as “Mr. Market”: a trickster who, when no one is looking, places the “risky” label on the “safe” asset and the “safe” label on the “risky” asset. The last time Mr. Market made this move was in 2000, when the NASDAQ hit 5000 and the only sure thing from an investment perspective was equities, particularly internet stocks. Today, it is the bond market in general and the Treasury market in particular that holds this elusive distinction. An August 22nd New York Times piece puts this situation in stark relief. According to the article, if the flight from equities continues at the current pace, “more money will be pulled out of mutual funds in 2010 than in any year since the 1980s with the exception of 2008 when the global financial crisis peaked.1 ” Simply put, we have come full circle since the dot com bubble. The intervening decade has resulted in equity returns of minus one percent per annum: the worst performance for any decade in the past 90 years. For a perspective, see Figure 1 below. In the 1980s and 1990s, U.S. equities compounded at 17.6% per year. One dollar invested in the S&P 500 in 1980 became $25 in 2000. What a ride! Interest rates collapsed during that period and P/E ratios soared, accounting for nearly half of equity returns in that two decade period. Earnings and dividends grew handsomely, but it was multiple expansion that drove the story line. By the time 2000 arrived, Mr. Market had reared his ugly head. With the internet bubble, Y2K fears, and the Dow Jones 30,000 forecasts monopolizing the attention of analysts and investors, Mr. Market took the opportunity to sneak the risky label onto equities, which had previously enjoyed the status of the perceived safe asset. In the world of investing, price is everything; and the price for equities soon reached the stratosphere, with the NASDAQ trading at over 250 times trailing twelve months earnings. Stocks, in other words, had become very risky. Since that moment in 2000, there have been two major corrections in equity markets and more than a decade of negative equity returns. Investors have realized that equities are far from a sure thing.But are investors now making the same mistake with bonds? Barring a Japan-like future for the U.S., we believe they are. Mr. Market is now placing the risky label on Treasury bonds: an investment category that has heretofore been considered safe. Our position on this subject is supported by the fact that rumors of deflation are in the air. In fact, there is widespread fear that deflation has already begun. And while it is easy to compare our current situation to the economic morass of the 1930s, there are significant differences that should be taken in account. In the 1930s, for instance, the dollar was convertible into gold, and it was not the world’s reserve currency. Today, the exact opposite is true: the dollar may have lost its function as a “store of value” but not its role as the world’s “medium of exchange.” The Euro crisis this year further ensures its continued role in that capacity. To be the country with the world’s reserve currency is an incredibly privileged position. If deflation can be avoided, it will be by the country with the world’s reserve currency: i.e. the United States. To get a better perspective on how the U.S. will move forward into the future, it is necessary to revisit the past. The social nightmare of the 1930s with its breadlines and 25% unemployment still looms large in our national consciousness. In 1946, Congress passed the Full Employment Act in order to ensure that this nightmare would not recur. This piece of legislation charged the Fed with pursuing full employment, stable prices, and an economic growth rate consistent with those two objectives. Basically, we got two out of three: we achieved growth and full employment, but not stable prices. Inflation persisted into the 1970s until Volcker tamed it. As for the present deflationary outlook, it is crucial to note that Ben Bernanke, the current Fed chairman, is not only an expert on the Depression but also a policymaker who will do anything to avoid a similar outcome in today’s economy. America prefers inflation to deflation; and because the dollar is the reserve currency of the world, deflation is unlikely. To provide a contrast in perspective, consider Germany’s equivalent to America’s Great Depression: the hyperinflation of the 1920s, when a wheelbarrow full of paper money was required to buy a loaf of bread. During this time of national crisis, the democratic institutions established under the Weimar Republic fell away as demagoguery blossomed, allowing for Hitler’s ascent. As a result, Germans fear inflation more than unemployment. Their policies, both past and present, have consistently reflected this view. But let’s return to the U.S. For the aforementioned reasons, we can probably discount the risk of widespread deflation. Consequently, the bond market then begins to look pretty risky. Treasury bonds in particular have been the victim of Mr. Market’s trademark switcheroo. This is in part because of their price. But it is also because T-bonds – and all bonds, for that matter – fail to capture two benefits that equities do. First, equities provide a hedge against inflation. Second, and even more importantly, equities capture productivity gains and thus provide protection from inflation as companies find ways to increase the prices of the goods and services they sell. Productivity gains are captured in earnings growth rates and operating margins. To explore this idea in more detail, let’s take a look at Figure 2 below. Figure 2: How Does the Real Economy Relate to the Financial Economy? Sources: Epoch Investment Partners, Inc.
On the left hand side of Figure 2, we have a measure of the real economy and on the right hand side, a measure of the financial economy, which is represented by the stock market. Real GDP is the product of the number of people employed in the workforce multiplied by their productivity (think output per man hour). For the world as a whole, workforce growth going forward could be in the range of one or two percent. Productivity measures generally are in the two to three percent range. Hence, real GDP on a global scale should fall somewhere in the three percent plus range. Should inflation average its historical measure of two to three percent, it is not unreasonable to assume that nominal GDP could grow in the four to six percent range. Over the long run, earnings growth closely mirrors the growth in nominal GDP. Thus, earnings growth of four to six percent is very realistic if not conservative. Observe how earnings have captured productivity growth in our model. Add the current dividend yield of two percent plus from equities to this number and we have an expected return of six to eight percent from equities versus two and one half percent from the 10-year Treasury bond currently. However, we still have to deal with valuation metrics. P/E multiples and interest rates are inversely correlated. Over a very long period of time, this correlation is a powerful one: minus 0.8 by some measures. By squaring that term, we get something statisticians call the coefficient of determination. Put another way, about 64% of the change in P/E multiples over time can be explained by changes in interest rates. Should the yield curve eventually shift upward, P/Es will be negatively affected and equity returns, at least initially, will be hurt. But bond returns would be devastated. Eventually the inflation hedge and productivity-capturing features of equities will offset the impact of lower valuation metrics. No such offsets exist for bonds. In our previous paper, “The Coming Change in Expectations,” we expressed our view that a slow down in real growth was inevitable, and that fact, combined with above average volatility and shortened holding periods by investors, would produce lower equity market levels. We also pointed out that free cash flow yields compensate one for much of this additional uncertainty provided one could lengthen his holding period from months to at least a few years. But the question remains: How many readers believe deflation will prevail today? Little or no employment growth and little productivity growth must be components of that view. With the massive amount of debt sitting on national balance sheets, a diminution of growth has to be expected. In the book This Time It’s Different, authors Reinhart and Rogoff point out that once debt to GDP hits 90%, a nation’s future growth rate may well slow by 100 basis points or more. The U.S. will reach that point shortly. And it takes six years on average to work off the excess debt load. Bernanke knows this stuff, too. Will he sit quietly by and wait? We need some inflation, which is good for stocks, perhaps, but definitely bad for bonds. In fact, only a minor surge in inflation could spell trouble for bond holders. If 10-year interest rates were to rise to four percent from today’s level (2.5%), holders of bonds would suffer a capital loss of more than three times the current yield. Today, the interest rate on standard non-inflation adjusted Treasury bonds due in four years has fallen to 1%. At the peak of the internet bubble, 100 times earnings was not uncommon for many NASDAQ stocks. With P/E multiples down to 14+ times trailing 12 months earnings, we have even more proof that Mr. Market has been switching the labels – risky for bonds and safe for equities. But the fact remains that dividend yields for equities exceed yields on bonds for hundreds of companies, and these dividends have growth rates attached to them of three to six percent: the same number as nominal GDP growth if one assumes constant payout ratios from present levels. Further evidence on dividend growth rates is reflected by the fact that, since 1957, dividends have grown an average of five percent per year for the S&P 500 index: a full 100 basis points more than inflation. With record corporate cash balances, below historic average payout ratios, and managements attuned to shareholder value creation, is this trend not likely to continue? They speculate further: “Is there any doubt that interest rates will rise over the next two decades as the baby boomers retire and the government entitled programs kick into gear? With future government finances so precarious, private asset accumulation and dividend income must become the major sources of retirement funding.” To us, this is a very logical conclusion, but an unpopular one at the moment. Mutual fund flows suggest the opposite conclusion – fear rules, return of capital supersedes return on capital. Unfortunately, a long term bond at these rates guarantees neither outcome. The Treasury bond holder is extrapolating the lack of credit risk in government bonds to the lack of duration risk as well. This is an important error. There is little compensation for taking on duration risk of a long term bond today. In addition, one may very well obtain the return of principal, but what will it be worth in purchasing power? It certainly will not reflect the impact of inflation or the productivity gains the economy might have enjoyed over the intervening period. For an example of contagiousness, consider the physiological process of yawning. Observing another person yawn can often cause you to do the same, even if you aren’t tired. This property of contagiousness also holds true for financial behavior patterns: they are often guided by an irrational form of “group think” that can be as widespread and communicable as a disease. To understand Gladwell’s second principle – that of little causes having big effects – consider what happens when a single piece of paper is folded over once, then again and again until the paper had been refolded 50 times. At this point, the height of the stack would approximate the distance to the sun! Fold it in half just once more, and the stack would reach to the sun and back again. In other words, geometric progression is a powerful force, and one that has particular impact on the financial markets. Gladwell’s third characteristic of dramatic, sudden change is the most important of the three. A compelling example is the same mathematical path of epidemics. His example is the fax machine. It was introduced in 1984 by the Sharp Corporation and they sold 80,000 low priced fax machines that year in the U.S. Over the next three years, the business grew slowly but steadily until enough people had faxes that it made sense for everyone to get a fax. One million machines were sold in 1987, and by 1989 two million machines had gone into operation. But 1987 was the tipping point of this phenomenon: and once it was reached, the explosion in growth happened very suddenly. Epidemics are sensitive to the conditions and circumstances of the times and places in which they occur. Gladwell refers to this condition as the “Power of Context.” It is an environmental argument and it says that behavior is a function of social context. Put another way says Gladwell, “our inner states are the result of our outer circumstances.” Today’s investor has experienced two heart-stopping drops in the market in ten years. He has realized a negative return in equities over that period, and simply wants a “safe” place for his money. Greed, the epidemic of 2000, has been replaced by fear, the epidemic of 2010. The future is unknowable. That is fact. But our flights of fantasy about the future should neither contain the double digit returns investors expected ten years ago, nor the morbid outlook implied by hundreds of billions of dollars flowing into fixed income instruments of long maturities and historically low, fixed coupon rates. No matter what the epidemic of fear might suggest, duration risk is huge today for bonds. Equities have and should continue to provide returns above bonds over the long term. Today stocks sell at 14 times trailing earnings, yield more than bonds, capture productivity gains in the earnings stream, provide a hedge against inflation, and benefit from the positive effects of expanding global trade (i.e. The Law of Comparative Advantage). The head of our Fed, our Congress, and virtually everyone in a position to affect policy will pursue whatever it takes to avoid deflation. I would not want to own long term Treasury bonds under that scenario. Inflation will return sooner or later. Equities, particularly those companies with demonstrated ability to allocate capital wisely, will be the winners over time. For investors with time horizons consistent with most retirement objectives, equities, particularly those paying dividends, will be a required component of any successful investment strategy. 1“In Striking Shift, Investors Flee Stock Market,” The New York Times, 8/22/10.